Swing music is alive and well, and our friend the electric mandolin has found a small but comfortable home in the genre, thanks to players like northern Ohio’s Seth “SethRo” Rosen. RU•Crazy, the new CD from Seth’s trio, Crazy Rhythm, is the second recent disc to feature his 1959 Epiphone electric (the other is Suspended Alive at the Spider by his quintet, the Suspenders). Whereas the Suspenders play traditional American swing and jump blues and do a lot of original tunes, Crazy Rhythm sticks to classics and covers, and favors an amalgam of Western—à la Bob Wills or Johnny Gimble—and European “Hot Club” styles of swing. The arrangements showcase the great fiddling of Jim Kelley, but there’s plenty of room for SethRo to get some licks in, either on the electric or his acoustic 1986 Flatiron A5. But it’s the Epiphone we’re really interested in here. It’s from the days when Epiphone was a real instrument company, not just a Gibson brand name for imports. The instrument closely resembles the Gibson EM150s of the same period—it’s an A-style, F-hole hollowbody mandolin with a four-pole P-90–style pickup. Like Gimble, Seth strings the Epiphone in single courses; unlike Gimble, he uses standard GDAE tuning. The Epiphone spices up "Old Cowhand" and "I'll Keep On Loving You," and provides a nice foil to Kelley’s lap steel playing on “Texas Blues.” And on “Cowtown” you’ll hear what may be a first in the history of Western swing music: twin electric mandolins! Kelley picks alongside SethRo on a StewMac 5-string (tuned down a fifth to FCGDA). Seth reports that he and Kelley play at least one tune in this configuration every time they do a gig. The group enlists bass (John Gallo), drums (Scott Flowers), and keys (Robin Montgomery) on most tunes, and Barb Withee holds it all together with some tight rhythm guitar. She and Kelley handle most of the vocals, although SethRo does take the microphone for “That’s What I Like About the South” and “I Can’t Believe You’re in Love with Me,” sounding a lot like Carl Martin. 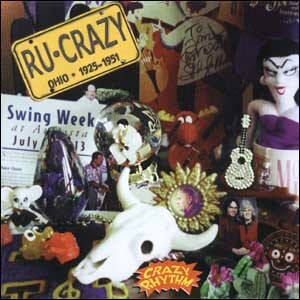 On the whole, RU•Crazy is everything a swing recording should be—enjoyable, romantic, danceable, lighthearted, with stellar musicianship all around. If all this sounds like fun to you, e-mail Kelley at bnjcrazyrhythm@neo.rr.com for information on ordering RU•Crazy by mail.